Not a full review, as the summaries were written five years ago. Dave Wolverton. After a Lean Winter. Written for an HG Wells War of the Worlds volume, this Jack Londonesque tale is set in the cold cold of Northern Canada. Terry Bisson. In the Upper Room. Virtual Reality with a lingerie angle – excellent story..
Hi-tech construction kits offer two bereaved children a chance to..
Hi-tech commodity traders in virtual arial dogfighting. Sheila Finch. Out of the Mouths. Xenolinguists attempt to bridge the chasm between humans and Venatixi through raising together infants from each species. The experiment is a hands-down failure. James Patrick Kelly. Breakaway, Backdown. Cleo attempted to breakaway to a life amongst the stars. But she is backdown on terra firma. On a small manmade planet, a small community services the needs of the space fleet. Caspar’s sister offers a quasi-religious service to absolve spacers of their sins. A non-human lands with urgent needs. This excellent story is from a French Canadian writer, translated by the author from French. Very subtle, and the picture on the family wall that is an ever so minutely (relativety) changing video feed from a long gone ship is an image which sticks in the mind. Brian Stableford. The House of Mourning. A mutated virus has caused problems for prostitutes and their clients. Very short SF – a neat little throwback. The ultimate in political contact with the voters – a VR presidential visit to a poor family. David Langford. The Spear of the Sun. 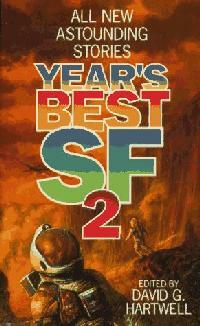 Very clever rewrite of SF history, with GK Chesterton having taken the role of John W Campbell. In this story Father Brown solves a deep space murder mystery. One of the first indistinguishable-from-human robots meets up with one of those who helped create him. She has been on the run for some time and their short lived relationship is doomed. A cyberpunk cycle repairman gets involved in political intrigue. Hartwell makes great play about his collection containing only stories which are ‘clearly SF’. So what is this story doing in this collection? Shows that Truth is Stranger than Fiction, as the OJ Simpson case covered some similar ground. Other elements of the story are acted out in some parts of the world ie public executions, relatives of those being executed being required to pay for bullets. Kathleen Ann Goonan. The Bride of Elvis. The King of Rock and Roll as an ET. Luck is in the genes. Connie Willis. Non-Stop to Portales. A charming tale of tourists sightseeing the home town of Jack Williamson as the founding father of SF.